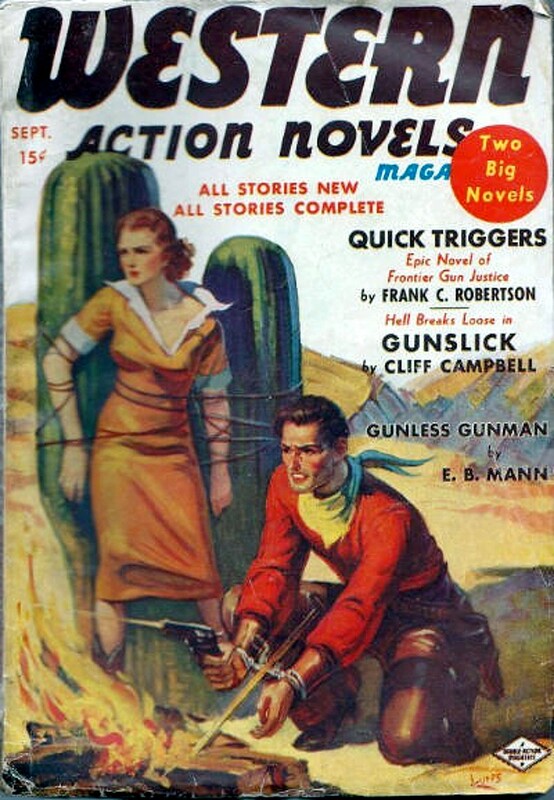 Is that a giant cactus the girl is tied to on this cover? That's gotta hurt! And the cowboy is handcuffed. There's got to be an interesting story behind this one. Whether it's actually in this issue of WESTERN ACTION NOVELS MAGAZINE, I don't know, but I'm sure there's some good reading since the authors include prolific and popular Western writers Frank C. Robertson and E.B. Mann, as well as the house-name Cliff Campbell and some lesser known names. The woman's clothing looks contemporary, and what about the flaming arrow?